In their nervous brushstrokes in unbroken yellows, greens and reds, these are terse paintings of optimal intensity, engendered by the high frequencies of their hues. In semi-abstract configurations Jan Menses peoples his pictoral space in juxtaposed groups, which are held in interaction by a sensitive occult balance. Or, to put it differently, they are made cogent by their dominant spatial tensions, achieved by composing on diagonal tangents. Yet, beyond their purely formal qualities these early paintings already hint at a phenomenon which will become omnipresent in the artist’s later work. Through relationships and contrast, significance and insignificance of shapes, these configurations spell out: dominance and submission. In another cycle of this period, Menses conjures up proliferations of softly rounded bodies that fill up the pictorial space in dense clusters on collision course. 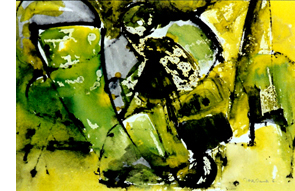 In mixed-media techniques, dominated by harmonies on the warm scale, from soft yellows through broken earthen hues towards reds, from delineations in blacks with specs of icy blues as miniscule portions of cold ground between warm bodies. use of color. As the artist’s attraction to kabbalistic mysticism deepened, his art became the sombre expression of his preoccupations.